Are Alpine Wood Burning Stoves an Eco Friendly Choice? Wood as a fuel is an eco-friendly choice in itself. Sustainable, renewable, and if used correctly and cleanly can become a completely carbon neutral way of heating at living space/home. Wood pellet stoves burn pellets made from recycled wood waste or sawdust; don’t be shy to browse our Alpine Stoves collection. However, the flame effect of a pellet stove is not as good as a log-burning stove. Wood burning stoves from Alpine push out far more heat than a traditional open grate where nearly most of the heat escapes up through the chimney. Heat output is measured in kilowatts and the stove size as well as the type of chimney, flue used and wood burned are all factors that determine how much heat is radiated. If you place an Alpine stove that is too big for the room, the room will become too hot on standard settings. If you attempt to run the stove continuously on a lower setting to reduce heat output, this can cause a build-up of resin. Over time, this increases the risk of a chimney fire. Where Can Alpine Stoves be Placed? Alpine stoves need a flue to take the expelled gases out of the room. In a large fireplace opening or inglenook, the stove’s flue pipe rises straight up the chimney, while stoves set in front of a smaller fireplace have a short horizontal flue leading to the chimney opening. 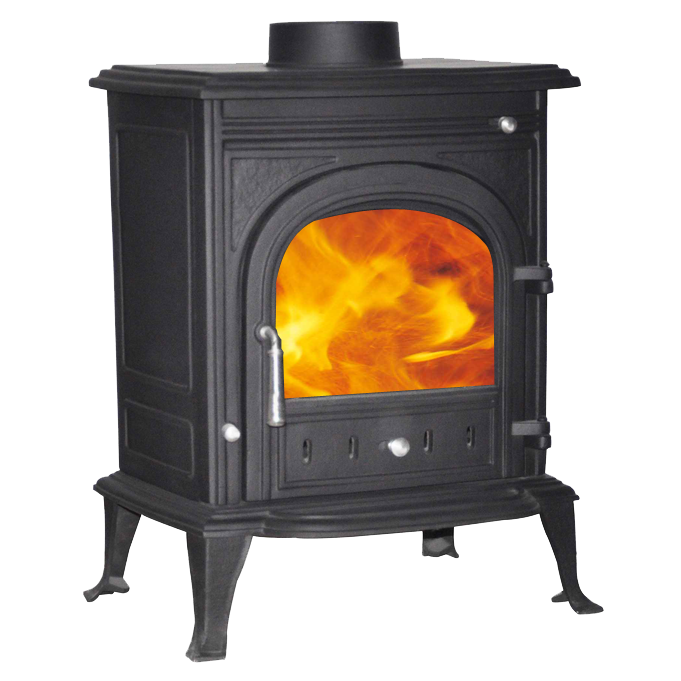 In a contemporary setting Alpine stoves can sit in the room rather than before the chimney, and the flue can be on view, rising straight to the ceiling instead of up the chimney, but beware if you have a young family, the body of the stove gets very hot so wherever you site it, you’ll need a good fireguard. The stove needs to sit on a ‘constructional’ hearth made from concrete, stone, slate or terracotta. This entry was posted in Alpine stove, Alpine Stoves, Cast Iron Stoves, Environmental, wood burning stoves and tagged Alpine Stoves on August 19, 2013 by richard.